Bill Carr is an actor, award winning satirist, writer, speaker and coach. For over twenty-five years, Bill has been making people laugh at what’s trivial while helping them think deeply about what counts. Bill helps people see their world in new and exciting ways. His unique blend of humour and insight inspires laughter and consideration, offering his audience a fresh perspective on what they face everyday. At the root of all of Bill’s work is the use of humour to help people reflect on their own innate human nature and understand who they are in a greater social context. Bill’s has recently published his first book Acting Up with Pottersfield Press. He continues to be active in film and television with a recent role in a Spike TV’s series based on Stephen King’s “The Mist” scheduled for release in 2017. 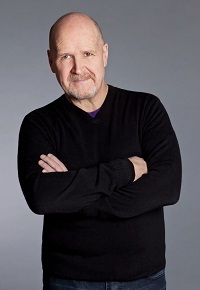 Bill’s career has seen him perform on stages across the country most notably in Nova Scotia at Neptune Theatre, Mermaid Theatre and the Atlantic Theatre Festival. He has written and performed in numerous radio dramas and news programs for CBC and has appeared on countless television programs, several movies and more advertisements than he would care to think about. Bill studied Philosophy, English and Theatre at Acadia University, and Theology at Christian Theological Seminary in Indianapolis, Indiana, and the Atlantic School of Theology in Halifax. Bill is a dedicated volunteer and serves in various capacities for a number of good causes such as the Alzheimer Society of Nova Scotia, Community Justice Society, ACTRA, Unicef, Canadian Breast Cancer Society, CNIB, YMCA, and the Abilities Foundation. He is an honorary Trustee of the IWK Hospital for Children and helps to host the IWK Telethon each year. He is a founding partner of the Atlantic Restorative Company, a social entrepreneurship focused on creating space for authentic human exchange and the use of restorative practices in all aspects of social life. Don’t Forget: We Are Getting Older! As the spokesperson for the Alzheimer’s Society of NS for almost ten years, Bill was exposed to many issues regarding senior’s health and even more specifically senior’s care. The demographics are clear; senior’s health is a growing concern for this generation and the next. The term ‘sandwich generation’ is an accurate one with many people being squeezed by pressures from their children and their parents. How do we discuss these issues as they affect us immediately and personally, and as a society? For discuss them we must. Whether you are a health care institution or association, a caregiver, a senior in need of care, or a family member challenged with the care of a loved one, ideas and feelings can be vented and reflected upon. Decisions made without this sort of consultation are decisions made in a vacuum and not responsible to, nor responsive of, those who are deeply affected. ‘Talking in Circles’ or “Deep Service” are two of Bill’s offerings that help to create a space where these issues can be carefully explored and voices heard from all sides. This is a passionate and heartfelt presentation; call us for more information. Bill explores research into how the brain works and how we can use this knowledge to create an environment that will nurture a creative response to change and keep a healthy perspective in unhealthy times. Bill focuses on empathy and what he calls “contagious inspiration” and discusses how nurturing our relationship with our selves and others can “wire our neuro” pathways and change surviving into thriving and tragedy into strategy. Is what we are saying what wemean? Is what we are saying what people arehearing? Where are our ideas really comingfrom? How do we talk about the “toughstuff”? How come I can talk to everyone butyou? Every industry is a service industry, every life a life of service on some level. The deep truth is whether at work, in our community, or in our home life “we do, in fact, serve somebody. As leaders and managers, we serve our company, our fellow employees and our clients; and to an important, and often neglected sense, we serve our community, our society and our world. At home we serve our families, our neighbourhoods, and again our society and the world. The depth and quality of this service is directly affected by how we see ourselves as being “in service”. Perception drives performance. When our lives are seen from a “service” perspective, it deepens our understanding of our place andmission in the world. Deep Service explores the idea of servant leadership in your specific industry context. Safety is a mindset. Much more than just rules and protocols, it is a way of seeing and then acting on what we see. It is about anticipation and the individual and collective responsibility for changing our workplace. Through his work with a number of diverse organizations, Bill has learned that the essential ingredient in creating a culture of safety is the development of a safety mindset. This mindset affects how we perceive our workplace and how we understand our responsibility to our selves and our co”workers. At its core, building a culture of safety is about building an empathic and caring community. What are our roles inlife? Who decides what those roles entail? Who do we really want tobe? What roles do others play in ourlives? How do I communicate from my authenticself?